Currently, a subdirectory of the root can only be mapped to a relative directory of the main project settings. The project I'm working on has a root project path, but several of the subdirectories represent virtual hosts. The root of the project doesn't actually have a URL at all. This allows various aspects of the site to utilize a single codebase without duplication. AFAIK you can setup such mappings right now in File | Settings | Deployment (select deployment profile) | Mappings -- I believe this is what you need. If that cannot do what you want -- then can you please give us more details (if available): an example of what are you trying to achieve (where and how do you want these mappings to be used)? That's actually the dialog I'm talking about. 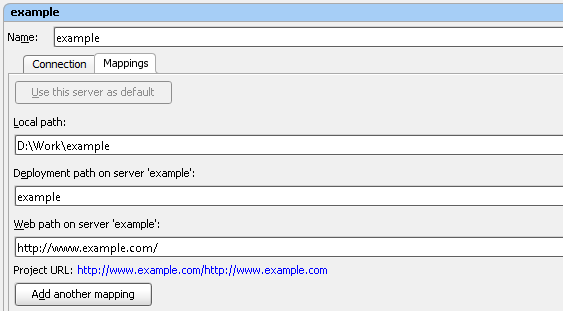 The Mappings tab specifically says "Web path: relative to web server root URL: http://www.example.com/"
Yep, my mistake. Somehow I was sure that this would work just fine (I was confused with another tool I have "touched" recently -- it had quite similar layout/interface -- possibly some custom plugin, do not remember as it was not on my computer). I would definitely like to have it implemented in PhpStorm.